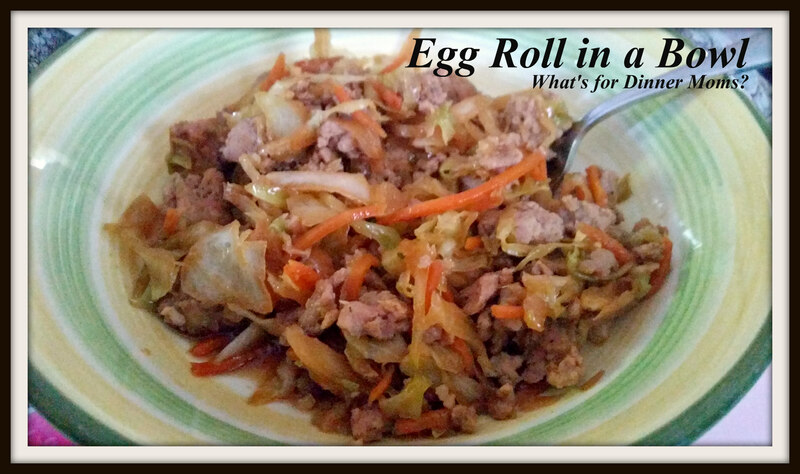 Egg Roll Bowl – What's for Dinner Moms? We have our room on a separate air conditioner because our room was added on several years ago but not hooked up to the main system. So, everyone has been sleeping in our room. We are basically camping in our room. What you can’t see it that this dish was pictured on my bed. Yes, we are even eating upstairs in my bedroom. It keeps us all from being short tempered and snapping at each other. So, we are watching quite a bit of the Olympics and old movies. This dish was fairly quick and simple to make. We shredded the cabbage, from our CSA, in the morning when it was cool and I spent the extra to buy the match stick carrots so I didn’t have to spend time and energy cutting them up. Sometimes the extra $.50 is worth it. Listen to me, use low salt or no salt soy sauce in this dish or it will be inedible. The Country Sausage is salty to begin with and if you use regular soy sauce you will be drinking a gallon of water just to try and choke it down. Really. This was a good dish. We all liked it and it was good and hearty. I made a side dish of green beans to have with it but a good side salad would work too. Cook the sausage in a large skillet or wok over medium heat until just cooked through. Use the side of a spoon to break it into small pieces as it is cooking. Remove grease from pan. Add cabbage, carrots, garlic, soy sauce and ginger to pan. Stir well. Cook 5-7 minutes until the cabbage wilts and the carrots soften a bit. Yes, can’t wait for cool fall temps. Supposed to be 90+ again today. Icky here. Yes! I hope remember the time when… is often heard in future stories they tell. I’m not kidding, this is what I planned to make for dinner tonight! Lol! Hope you like it! Do you recommend using regular soy sauce rather than low sodium if you use ground pork instead of the sausage? Thanks! Yes if you like the salty flavor in egg rolls. The spices in Country Pork are heavy on the salt and combining both regular soy and sausage are too much. If you are using plain ground pork or chopped pork steak regular soy would be fine.